When tennis fans from the world over descend on Arthur Ashe stadium next month for the annual US Open tournament, they won’t be focused on sustainable building practices. They’ll be thinking TENNIS and nothing but. Yet all year long the US Open organization has been quietly and deliberately making choices to reduce environmental impact while maintaining one of the most recognizable brands in sports. 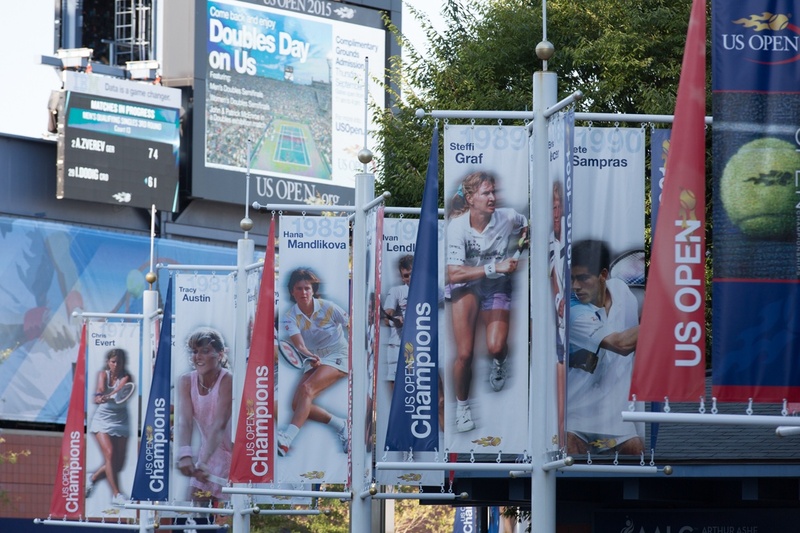 Each year since 2008 in fact, the United States Tennis Association has marched forward on its green initiatives, such as waste diversion and carbon emissions, to bring fans a cleaner, more sustainable event. The organization even carries their green initiatives into sustainable design and green building materials, but you won’t find recycled particle board furniture here. 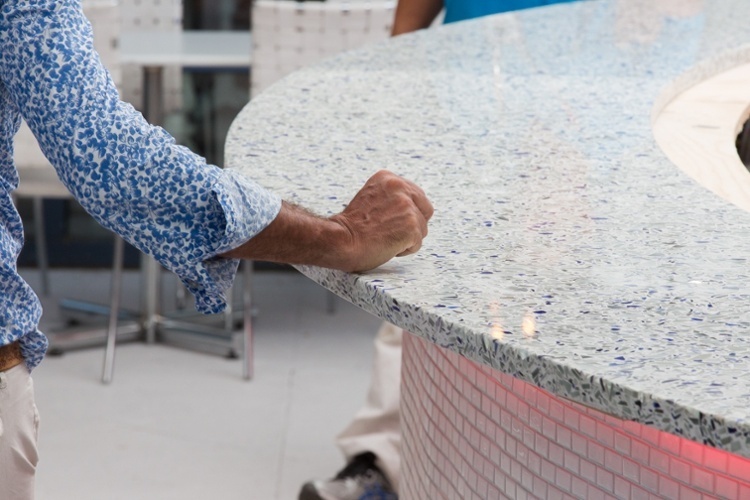 Instead the US Open chose sustainable and high-end finishes like Vetrazzo recycled glass counters, which contribute LEED credits to projects. Inside the stadium is Mojito’s Bar and Grill, a Latin-inspired restaurant available to all ticket holders located on the ground floor near the Patio Café. Clad in mostly tennis white, the outdoor restaurant is a crisp, modern respite from the baking August sun where fans can gather for cocktails and a post-game meal. 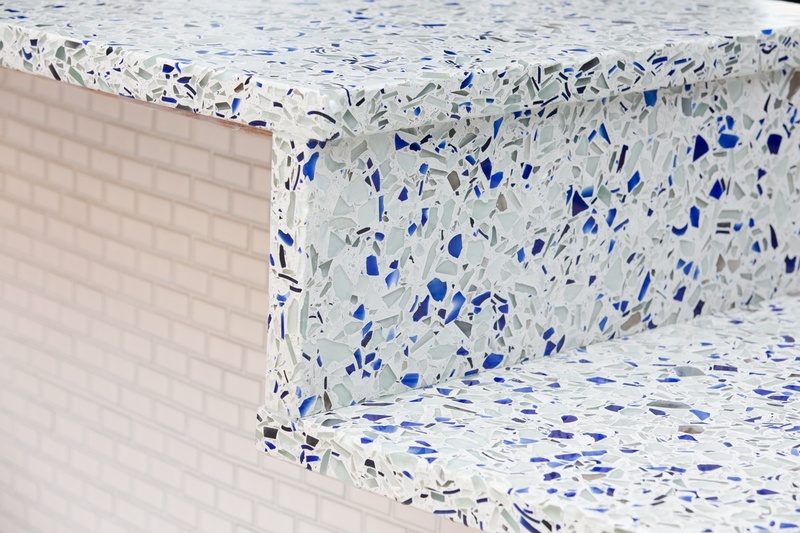 Anchoring the space is a circular bar made from the Vetrazzo’s recycled glass slabs in Vetrazzo Chivalry Blue. The exterior portion of the circle bar was completed last year. An interior service bar featuring a raised shelf bar for liquor and a lower shelf for working is currently under construction and is expected to be completed in time for this year’s event. This will make the bar 100 percent complete with Vetrazzo slabs. 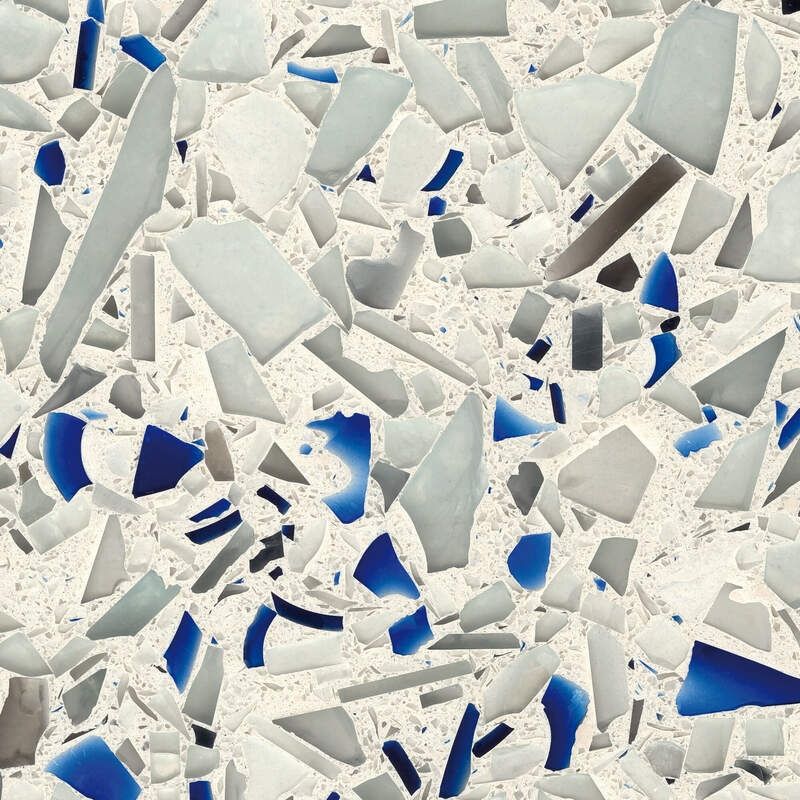 Vetrazzo’s Chivalry Blue is made from a blend of varying shades of architectural salvage glass, cobalt blue Skyy® Vodka bottles and clear glass bottles in a white cement binder. Slabs are handcrafted at the company’s atelier in Tate, Georgia and are hand finished. It takes eight craftsmen a full day to create just one slab. 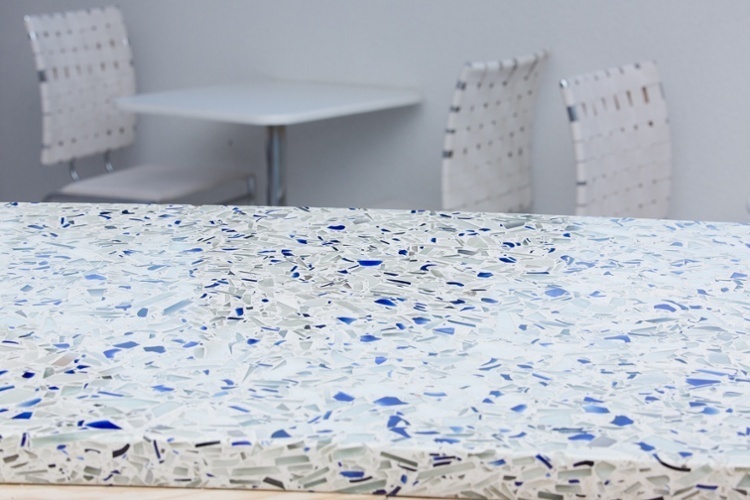 Each slab is made with pre- and post-consumer recycled glass from local curbside recycling programs to reduce our carbon footprint. The tournament may only last two weeks, but the outdoor surfaces must be able to endure years of environmental exposure. Here in the Northeast that means intense rays and damaging snow and ice. 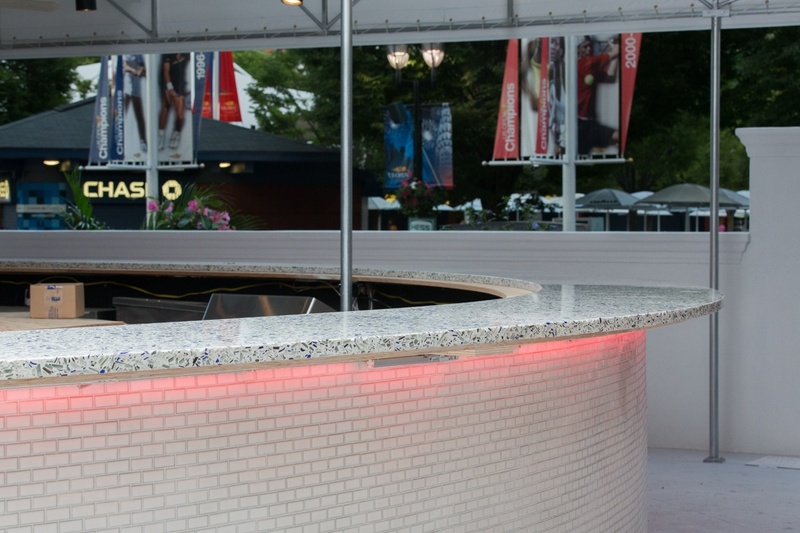 Designers involved with project said they originally considered quartz for the outdoor bar, but instead chose Vetrazzo’s crushed glass slabs in part for their ability to withstand weather. (Quartz products have a greater potential to warp, fade and even crack when exposed to direct UV sunlight). The deep blue of the Skyy vodka bottles against the white cement binder is a match for US Open’s classic blue and white logo. That the surface is beautiful and recycled allows the US Open to communicate the brand and its ethos in a subtle but distinct way, and at the same time uphold the organization’s principles of sustainable business.